Family barbecues are one of the many things I’m looking forward to this summer. Now that we are back in Ontario, we’ll finally be able to attend family get-togethers and visit loved ones that we haven’t seen or spoken to in years! My parents have a gorgeous backyard complete with a fully equipped bar, outdoor fireplace, and state-of-the-art grill for my dad, the self-proclaimed grillmaster. My parent’s backyard barbecue parties are legendary! My mom, sister and I all enjoy cooking and trying new recipes. You can always count on a delicious variety of food on the menu at these family affairs. My mom makes her famous sirloin beef burger patties and my dad (aka the grillmaster) barbecues them to perfection. 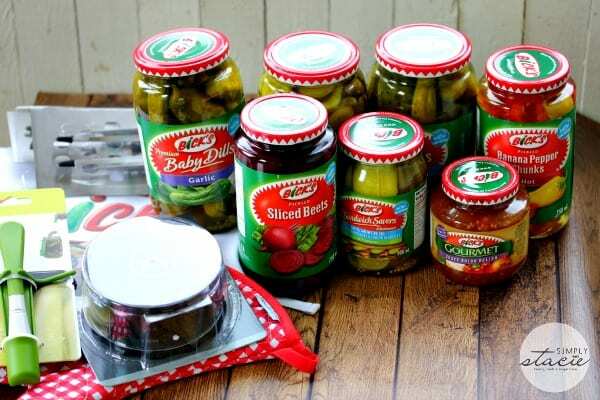 Bick’s pickles and relishes are a staple at any summer barbecue party. A good hamburger always has a pickle on it, in my opinion! Bick’s sent me a Burger Kit for our summer backyard barbecues. It included a chef’s apron, outdoor oven mitt, a pickle fridge fork, premium grilling tools, a burger press and, of course, loads of Bick’s products! 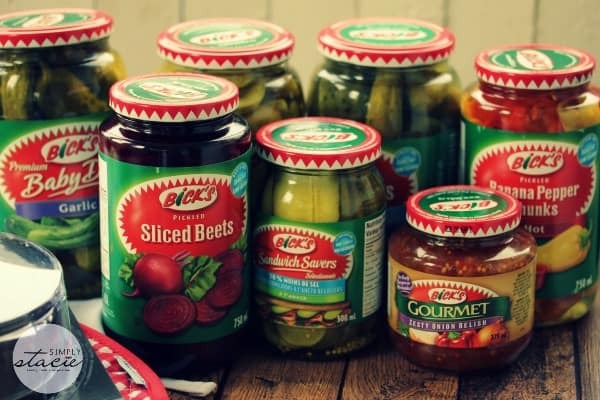 I’ll be adding to our condiment table all these fabulous Bick’s products like Baby Dills- Garlic, Sandwich Savers Extra Garlic, Baby Dills 50% Less Salt, Yum Yum Sweet Pickles, Zesty Onion Relish, and Sliced Beets. All of these products can be used to create a delicious burger. I made Stampede Burgers inspired by the famous Calgary Stampede. They are spicy, juicy and a little messy as a good burger always is! I can’t wait to make this recipe this summer at our family barbecues. I think they’ll be a hit. 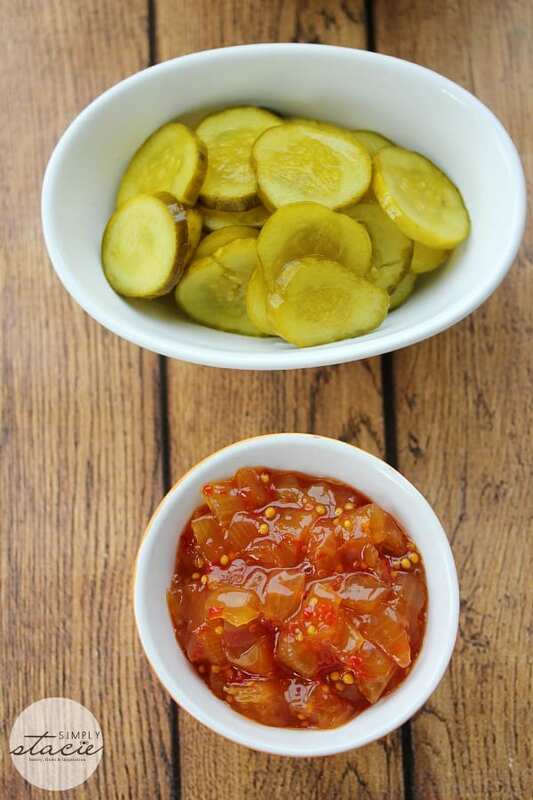 The recipe is made with four Bick’s products including Bick’s Zesty Onion Relish and Bick’s Yum Yum Sweet Pickles. It also has Bick’s Garlic Baby Dill Pickles and Bick’s Banana Pepper Chunks. The only part I skipped making with was the fried pickle garnish. I went to the grocery store to pick up all my ingredients to make the recipe and forgot the eggs! The next time I make the recipe I’ll be sure to add the garnish. 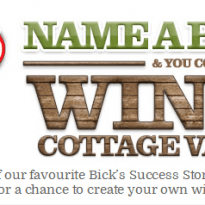 This summer Bick’s is inviting Canadians to Name a Burger Success Story to win a dream cottage vacation! I wish we had a cottage and I can see myself relaxing by the lake with a good book. To enter to win a dream cottage vacation, just name a burger at Bicks.ca. There are a bunch of different burger varieties to choose from so pick one that appeals to your tastebuds and give it a great name! The contest is open to Canadians only and ends on September 1, 2014. You can enter once per day if you like. You can also earn bonus entries when you share the contest with your friends. It was fun browsing through the unique burger creations. Some of them I would have never thought to make, but they sound like they’d be good. Poutine burger? Yes, please! 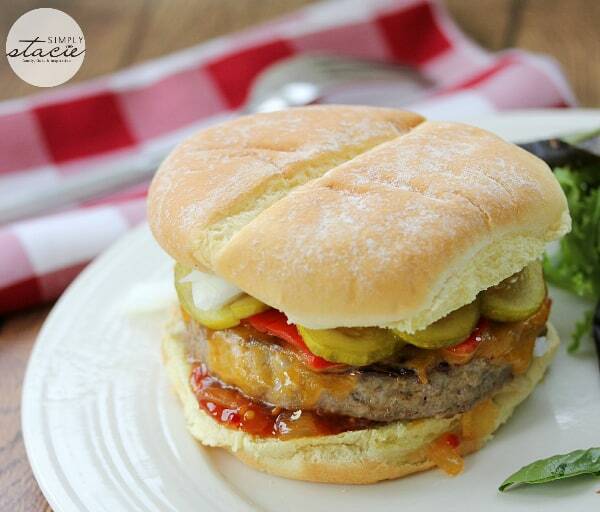 Visit Bick’s to enter the contest and get inspired to create your perfect burger this summer! What will be on your grill this summer? Spicy, juicy and a little messy like a good burger should be! Spread bottom bun with BBQ sauce and relish. Top with burger and remaining ingredients. Garnish with fried pickle. Tip: to fry pickles, quarter Bick’s Garlic Baby Dill Pickles, toss in flour seasoned with chipotle chili powder, dip in egg and dip in seasoned breadcrumbs. Fry in oil on all sides until crispy. Your Stampede Burgers look so delicious! I really like the Brick’s products but I have not seen them in my stores. I will have to make this recipe for the 4th of July! Looks amazing! I hated pickles then I got pregnant and all I wanted was a pickle and mustard burger. Feel free to grill extras for your friends. 🙂 Haha. I’ve never heard of Bick’s but wow so many products, and they sound great. 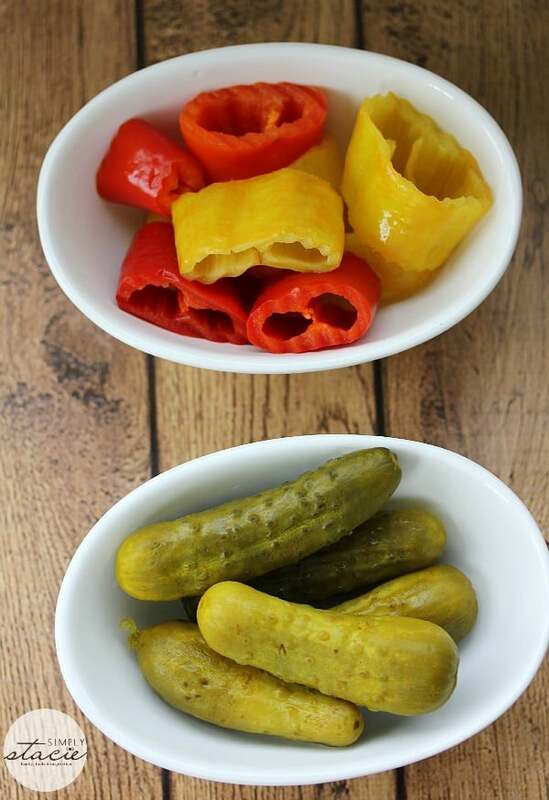 I’m craving those banana pepper chunks, and the burger would be great for dinner. Grilling is a must during the summer and really adds to get-togethers. I’m glad you have many in your future. I love Bicks and you have to have that pickle on the burger mmmmm so good, well I’m for sure having burgers this weekend now!! My Family would flip over the Stampede Burgers. Sounds so delicious! Thanks for the recipe!! These are all the toppings I use on my burgers too. I also like the Bicks corn relish on my burger. So yummy! I am a pickle lover, but Bick’s is a brand that I’m not familiar with. That is a delicious looking burger, I cannot wait to try it. Thank you for sharing this review post and recipe. I have never heard of this brand but it looks and sounds delicious! Thank you for sharing. Have a great barbecue season! I will look for these products when I shop near the Canadian border! Bicks are OK, my mother-in-law was a Polish woman so she made her own pickles, swimming in garlic, and they were the best pickles I ever tasted. My daughter loved them so much, she became known as my Polskie Ogorki. Unfortunately my mother-in-law is no longer with us, so we can’t partake in her pickles any more, but if you were to open my fridge you’d see about 4-5 jars of pickles and relishes. I like pickles in my burgers, this is excellent! I love burgers and I don’t buy anything but Bick’s, that burger makes my mouth water! Oh my goodness, that burger looks incredible!! I’ve never heard of Bicks. Thank you for sharing. I’m not a pickle fan, but you make it look like I shoud try them. I’ve never heard of Bicks, but I really like a good dill pickle. The burger looks really good, I definitely like a great burger, but I don’t like anything on it except ketchup, cheese, tomatoes and lettuce. The hot rings sound good though. Heck I haven’t had dinner yet!! yummmmy I want one of these. any one! just picked some up this weekend cant wait to grill them! Those burgers make my mouth water!! Thanks for posting! I’m definitely inspired! Looks delish! i really should not look at posts like this at night time. lol my goodness my favourite!!!!!!!!!!! yummy! I can’t get enough pickles. So yummy! And what a fun contest! Yum! I’m an absolute pickle fanatic! I’ve been known to eat an entire jar of pickles at once, just by myself! And yes, they’re a must on a good burger! Even when I order a burger from a restaurant, it’s always “extra pickles, please!” Bicks has such a wonderful selection of pickles and relishes! 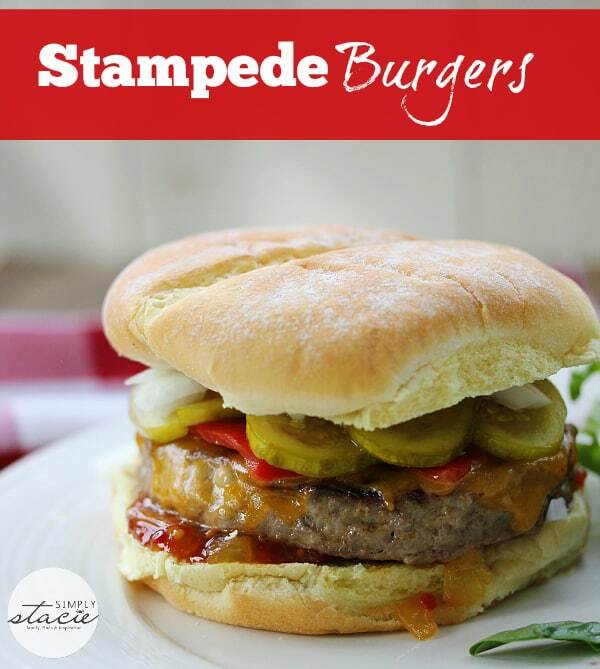 Stampede Burger, just in time for all of the stampedes! I love pickles,i eat them with everything ! Nothing but Bick’s for this household. It’s a crisis if we run out of pickles. Their zesty onion relish is our favourite! We put it on our veggie burgers all the time. Please please can anyone tell me where I can buy the Zesty Onion Relish. I tried it while in Alberta & have looked everywhere to find it with no success. Now headind back to Vancouver BC and really want to get this. What a burger! Yum. I say bring on the grill and bring on the mess.